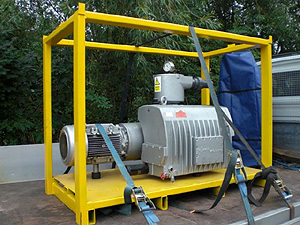 IBS offer a wide range of Industrial Vacuums and Vacuum Loader either new, reconditioned or service exchange representing all of the popular, tried and tested technologies including liquid ring, rotary vane (oil lubricated and dry running), side channel, roots types (including boosters) and claw. We support all of the main manufacturers including: aerzen blowers USA, Robuschi, Busch, Becker, Rietschle, Edwards, Leybold, Siemens, Gast, FPZ, Nash, Sihi, Speck and Elmo. Service Exchange – If you cannot afford the time for IBS to repair your vacuum pump they will forward a reconditioned unit immediately to minimise your downtime. Upon receipt of your old machine, providing it is in serviceable condition, IBS will charge for the replacement at the service exchange value. If your vacuum pump is not serviceable, IBS will upgrade your purchase to reconditioned status.